According to Boater Magazine, there are six personalities of recreational boaters. The article had us rolling on the floor laughing! With October being Annapolis Boat Show Month, we thought it would be interesting to explore this subject of boaters. But, we are going to take it a step further. We are going to offer a neutral comparison. Sailor or Power Boater? Are they really all that different? While it may seem these two worlds are dichotomous if we stand back and look at the big picture we realize they are more similar than we think! Sailors often scoff at how much money power boaters spend on fuel. However, they will not bat an eye at spending thousands upgrading their sails, many of which are comprised of synthetic fibers made of, you guessed petroleum. Therefore, essentially, aren’t they both spending money on the same thing? Like any enthusiast, power boaters and sailors love to sit and “talk shop at the dock.” While power boaters tend to chat about the best places the fish are biting, or the best docking spots to catch some good eats, sailors may be chatting about the weather or what they have broken and fixed after a hair-raising adventure. However, while this dock talk seems segregated, it is camaraderie all the same. There is no denying, whether you are a power boater or a sailor, you get out on your boat for one thing, because you love being on the water. If you have ever talked with a sailor or a boater, you will see their eye glaze over as they go to their “happy place” describing memorable excursions, beautiful sunsets, and amazing places they have visited. If you are considering buying a boat or taking sailing lessons, the best place to seek advice is from the source. Boaters and sailors are completely in love with what they do and are willing to share info and wisdom. They will offer honest feedback because they have been through it all! 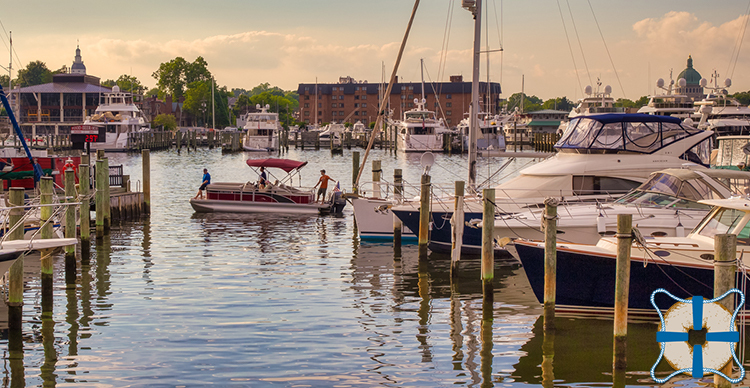 Here in the Chesapeake Bay, it does not matter whether you are a power boater or sailor, everyone on the water offers up respect to the fragile nature of the marine environment. Although they take advantage of it in different ways, they all understand the importance of protecting and preserving the Bay. Ok, we threw this one in there. But, honestly, whether you are a power boater, a sailor, an angler, a canoer, stand-up paddle boarder, kayaker, or swimmer you know that you need to fuel up your tank before hitting the water. What better way than with bagels from Naval Bagels? Bagels provide delicious sustenance and long-lasting energy for a day on or in the water. The next time you plan to head out for a day on the Bay come into Naval Bagels and get food for the crew! So, what are your thoughts…Sailor or Power Boater? Are they really all that different?